I got a rather unanticipated treat of visiting the site of the CRON raid again - this time for the Raid de Promocio, a 20 km, 40 km, and 60 km ride day. It was double the size of last week's 120 km** Raid del Cron: 117 horses, of all ages and sizes, various states of fitness and experience. For many horses (and riders) this was the first outing of the season, and for some, the first raid experience ever. Some of the horses just looked physically young; some of them were definitely mentally young, and got their first taste of 'ridecamp', the vetting ring, trotting out, actual 'competition' with other horses, starting in a group, and going out on course a second or third time after the vet checks. All the loops were under a control speed of not faster than 15 km/h, but not slower than 10 km/h, and pulse criteria was 56 bpm. I happily ran into some old friends, met some more new ones, and generally soaked up the relaxed family atmosphere on another pleasant and picturesque spring day in Catalonia. Step outside in the morning on the balcony of El Moli (the Mill) outside of the small village of San Julia de Vilatorte in this corner of Catalonia, Spain, and breathe deeply of the crisp clean air under the bright early sunshine. it is bracing, fragrant with spring and a nuance of... pig doo. This area produces a lot of pigs, and I dare say, a lot of pig fertilizer that is used on the ample farmland. It's not enough to make you gag, but just enough to put a slight crinkle in your brow, or raise an eyebrow, or wrinkle your nose just a bit, depending on which way the wind blows. Put on your hiking shoes, grab your backpack and your walking poles (or, in my case, the Raven), and head out across Spain. Or Europe, for that matter. How about destination: Poland, or Norway? I started right outside El Moli, walking the Ruta dels Moulins trail along the creek, which soon joined up with the GR2 Footpath. The GR Footpaths in France and Belgium (Grande Randonne'e), Holland (Grote Routepaden), Portugal (Grande Rota), and Spain (Gran Recorrido) are a network of long-distance hiking trails in Europe, that are connected with the European "extremely" long-distance footpaths, covering 60,000 km, that will take you in every conceivable direction over Europe: middle of Norway to the middle of Italy, tip of Greece to the bottom of Spain, Ireland, Great Britain, top of Finland to tip of Turkey, Portugal to Estonia or Poland. Designed by the European Ramblers' Association, founded in Germany in 1969, today it is composed of 50 ramblers' organizations from 26 European states, with over 5 million individual members. The local ramblers' organizations maintain the paths, markings, huts and campsites along their routes, some of which have been in existence for over 100 years; work on preserving rights of way; and promote the history and culture of the areas through which the trails pass. 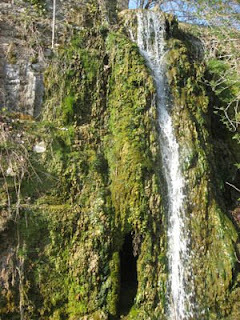 The trails vary from forest trails to paths along fields, roads through villages, dirt roads between fields; past old Roman ruins, old mills, castles, farms. You can follow the silk routes of Europe, the Troubadour routes, the European parks and Garden route, the Wenceslav route, or the Hanseatic route. Simple markings indicate the route, on tree trunks, rocks, walls, signposts, or on the ground, of (most often) red and white paint: white stripe over red stripe indicates the correct path; a red and white "X" indicates the wrong direction. They aren't always easy to see, (for instance, sometimes a tree trunk is overgrown by vines), and sometimes you take a wrong fork in the trail or road a dozen yards before turning around to try another fork or two until you find the correct way. The Raven and I followed our GR2 path skirting Sant Julia on side paved roads, then onto dirt roads and trails between planted fields. After we passed a private castle and some old pig farm sheds, the route began climbing, until we had a decent view of Sant Julia in the distance below us. I don't think horses are prohibited, although I didn't see any signs of horses; though on another part of the GR2, Paul used to ride his New Zealand horses. That was a good long stretch, and good underfoot, though the area I walked had a lot of pavement, and plenty of stones on the trails. 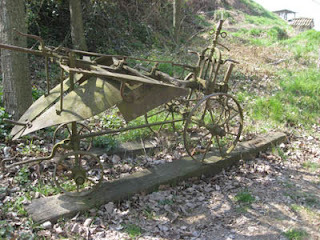 I met two other walkers today, and have seen bicycles on the trails also. 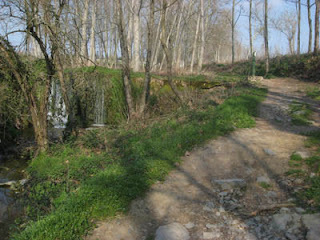 In the region east of Vic, Spain (an hour north of Barcelona), you can follow, for about 2 miles, the Ruta dels Moulins - the Route of the Mills - a series of old canals and mills that used the water flow from the spring-and-run-off-fed creek, to grind wheat and sharpen farm tools over the centuries. Many of the old mills have been restored and are now residences, having first been built between the 12th and 16th centuries. 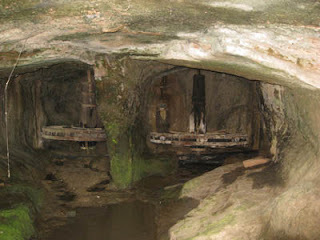 Some are crumbling and disingegrating ruins, half hidden under vines. 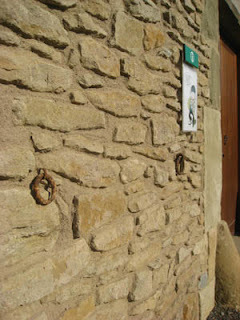 El Molí de la Calvaria, where I'm staying, has evidence that the old lock was built in the 11th century; the first document is from 1236 AD. 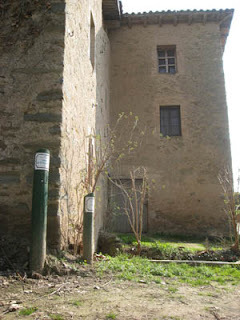 The original mill is on the ground floor, and the house above was built in the 16th century. 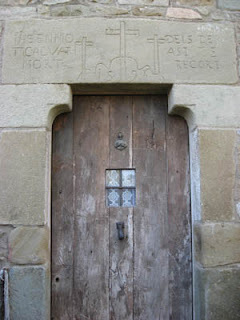 Above the door is carved in stone: IHSENMO TI CALVARI MORT DELS DE ASI TE RECORT, in probably a mix of some old Catalon and Latin, meaning, roughly, "The Dead here will think of you," which I'm sure is meant to be some sort of blessing. (Or, if you try googling the translation: "...agony of death by now well pruned." Hmmm...)The inscription is, you can still clearly see, from 1596. The mill is now a museum, and the owner still runs it on Sundays to show how it worked (and to feed the resident ducks with the seeds : ). 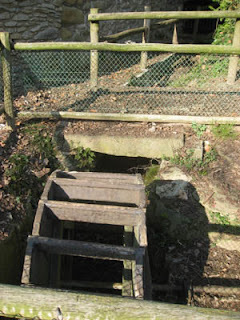 A lock is opened in the retention pond, water is funneled under the mill to turn the two large wheels (and a smaller one outside, connected to a small circular stone, which was used to sharpen tools), which turn the millstones in the mill, which grind the wheat. 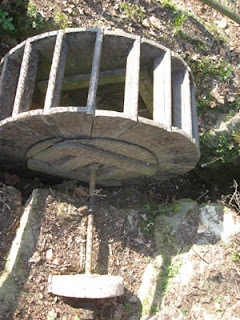 The millstones have grooves, or furrows, separating flat areas, or lands. The grooves furnish cutting edges and channel the ground flour out from the stones as the wheels turn. The furrows and lands are carved in repeating patterns, or harps. 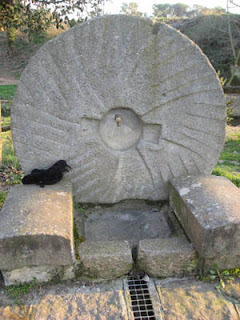 This millstone has 8 harps. Head north from Barcelona, Spain, for about an hour to Vic, and from there take a smaller highway and some side roads further north; take a left on a smaller road and then take a right on a still-smaller road, and then one more left on a tiny winding road, and you'll end up between the little villages of Sant Pere de Torello and Sant Vincenc de Torello, where you'll find, over this lovely spring weekend in March, the Raid del Cron - the Club de Raid Osona Nord. It was not the Catalon Championship as it had been the past few years, but it was an exceptional CEI** 120 km ride, held for the 14th year. Exceptional for the completion rate (over 70%), the weather, the organization, the prizes, and most of all, the pleasant, friendly, relaxed atmosphere. Really, the Spaniards know how to put on an endurance ride. Some of the top Spanish riders were at an endurance ride in Badajoz, Spain, this same weekend, but there was still an ample herd of 54 with very capable riders queued up at the starting line under the red balloon arch at 7:30 AM Saturday morning. Three foreign riders joined the fray: Denis Pesce and Marilyn Lemoine from France, riding horses that each completed a 120 km in France last year; and 72-years-young Mitsuko Masui from Japan, riding the 10-year-old gelding Rhaver. She'd be riding with Juma Punti's Team of 5, headed by Marc Costa. Mitsuko has been coming to Europe (and the UAE) to ride endurance races since 2003; this was her first race in Spain, and she was accompanied by her regular groom/crew and good friend, Gaella from Stephane Chazel's stable in France. There was a damp chill in the air, a touch of frost on the grass, and a slight fog before the sun reached the raid grounds. The horses were warmed up well - all were handwalked for a good 15 minutes before anybody ever mounted up, then they were ridden for 15 minutes before the start. New Orleans jazz played on the loudspeakers at a pleasant volume, and those people not helping the riders stood around chatting. There were quite a few smiles on faces as the riders started on their first kilometer of the day, and the horses all looked eager and quite sane. I jumped in my great little diesel VW car and raced behind a line of crew cars to the first Assistencia point for this 32 km first loop. The sun was trying to burn through a layer of fog, leaving dew on the grass, while crows cawed and knocked and quorked in the nearby trees. The crews gathered around and had a good time telling stories, and though it seemed a little chilly yet for pouring water on horses, a few people began inching down the trail with their water bottles in the direction from which the horses would come - there just might be a small advantage if you can get water to your rider just a little sooner before the other riders get theirs. Cesar Tasias on Oliver TB was the first one to canter by with a 5-minute lead, and then the rest of the riders, flowing past in a steady stream. Near the very back of the pack came the team in orange, Juma's Team, with Mitsuko Masui tucked neatly in with them. After they passed I ran to my car to follow their crew, as I had no idea where I was driving to next. By the time I got in my car, Juma's van was gone, so I followed a few other cars and we raced off. Now, it seems to be a prerequisite for crewing assistence in Europe to, at some point, 1) be on one-lane (and narrow one-lane, at that) winding roads with blind curves so you can go really fast, and 2) to get lost at some point. Not because of bad directions on the map, but because I wasn't following the map, and I was following some other people who weren't following the map. They realized it was the wrong way, and we each made a 12-point turn on the narrow road and raced back the other way; and suddenly we started meeting the crew cars for the leading riders, coming back our direction on the narrow winding one-lane road. We got into a long jam - nobody could go forward or backward in either direction - and while they tried to figure it out up ahead of me with inches to spare, since I was the last car, I just backed up onto a side road and turned around and waited to follow the leaders' cars on to the next point. I think a few of those cars are probably still stuck on that road. I raced onward behind my new leaders in the correct direction, to the little village of Sant Pere de Torello, dominated by the Santuari de Nostra Senyora de Bellmunt. It is perhaps significant to note that Sant Pere was, some time before the 1930's, very famous for the manufacture of cowbells. The crew point was in a pleasant park by a creek, and it was warm enough now, and the pace honest enough - the leaders moving along at over 15 kph - that the horses all got doused with water, and most of them stopped for a drink. For the riders it was only 7 km back to camp for the first 30 minute vet check. 38 minutes separated the first and last horses in, and there were no pulls after this first loop. Cesar Tasias and Oliver TB led out on the 28-km Loop 2 by 5 minutes over Marta Pujadas on Volvo, with seven more in hot pursuit within the next 2 minutes. 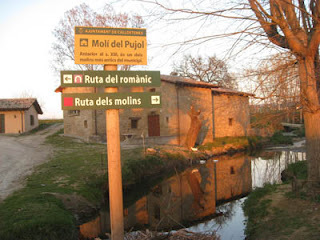 Conveniently for the crews, both assistance points for Loop 2 were at the same spot, on top of a small hill, overlooking green fields, a ridge of the Pyrenees mountains to the east and the west, and the Santuari de Puig-agut to the south, completed in 1886. The riders arrived at this crew point after 11 km, did a loop of 17 km, and passed through the same crew point again before returning home by the same path. Tasias and Oliver TB led through the crew point the first time, but on the return pass-through, Javier Maxenchs was slightly in the lead on his big palomino Walker. At last year's 9-day Tierras de Al-Andalus raid, Maxenchs finished 1st on Walker on the final day, and 11th overall riding Walker and another horse in the Equipos. Maxenchs arrived back at the vet check in camp 2 minutes ahead of Tasias, but Walker took 7:22 to pulse down, to Oliver TB's 1:44, which dropped Walker back to 7th place, but only 5 minutes behind Tasias. 8 riders, including Maxenchs, left within 2 minutes of each other. 5 horses were eliminated at vet gate 2. Loop 3 was a repeat of Loop 1, 32 km, and once again, Maxenchs and Walker were in the lead arriving back at the 3rd vet gate, just 16 seconds ahead of Alexandra Dachs and Falco de Masferrer. Once again, it took Walker a long time to pulse down - 13 minutes - which dropped him back to 8th place, which left Dachs a 5 minute lead on the final loop of 28 km. She took off at a gallop. In hot pursuit and almost close enough to touch each other were Marta Pujadas on Volvo, Alex Luque on Sankoc, Cesar Tasias on Oliver TB, David Fernandez on Enia, Rut Comas on Sahara, and Pol Abril on Lucero Miki, a 7-year-old gelding who finished 25th in last year's Raid del Cron. All these riders had averaged over 15 kph for the first 3 loops. Six more horses were eliminated from the race after loop 3. The weather never got as hot as most people had feared; by the hottest part of the day, it was only about 25*C. There were a lot of horses with a rather substantial coat of hair, some partially clipped, some not at all. The final 28-km Loop 4 was the same as Loop 2 - the same double-assistencia point for crews, and the same path for the riders, only with the out-and-back-to-assistence-point loop a change of direction), Alejandra Dachs came galloping through in the lead the first time, pony tail whipping in the wind, smile on her face as she grabbed water bottles from her crew and kept going. 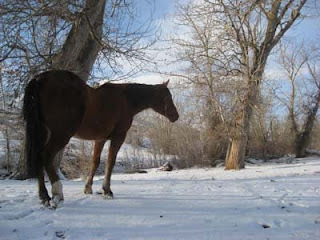 Her horse was showing signs of tiredness however, as she was shaking the reins at him every few strides. Tracking only a few minutes behind her were Alex Luque and Marta Pujadas cantering together, followed closely by David Fernandez. Pol Abril, then Cesar Tasias were next, all those horses looking like they had plenty of gas left in the tank. After the 6-km loop, coming back through the assistance point, Alex and Marta had taken over the lead, still moving at a comfortable canter, with Alejandra in view just over their shoulder, and trying to keep up. Pol Abril had moved into fourth, with just 11 km left till the finish. Back at camp, a crowd was gathered around the finish line. A murmur started rippling through - the horses were getting close! The last 40 yards were on a curve on a dirt track, wide enough for maybe 7 horses, so there wasn't a view of who was coming, or how many together. And right then, with the most terrible timing, a yell for help went out - the finish line balloon arch was collapsing! "The horses are coming!" There was immediate panic from people at the finish line - what to do? Run around the curve and wave the horse(s) down to a stop? (If that was possible). Pull the arch down and drag it out of the way? (Not possible) Hold it up? One tall guy jumped and could touch it, but he wasn't tall enough to hold it up out of the way. 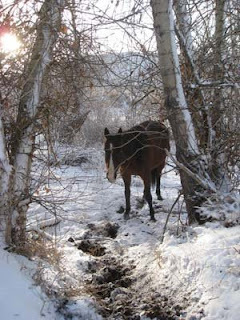 Someone thought to grab a nearby broom, and he shoved the arch up with a broom and a prayer, just as the first horse appeared around the corner at a gallop. It was Marta Pujadas, whose horse Volvo did a double take at this collapsing big red arch that was not in that condition the other seven times when he passed under it, and he blew the turn, almost unseating Marta in the process. She managed to stay on and straighten him up, and Volvo cantered under the horse-eating sagging red balloon, with Marta having to duck so as to not get knocked out of the saddle. Luckily Marta had a 1 1/2 minute lead over second place Alex Luque and Sankoc, and the balloon arch was restored to its former non-threatening glory before they cantered crossed the finish line. Seven minutes behind Alex came Alejandra Dachs on a visibly tired Falco de Masferrer. He recovered to the 64 bpm criteria in 7:37 to go into the vet ring, but was eliminated by lameness. Marta's horse recovered in 9:31 to present, and upon the final inspection, was declared the winner. Alex's horse was also tired, and took a full 25:36 to come down (maximum time allowed was 30 minutes), but Sankoc also passed his vet inspection to secure second place. The winner averaged 16.65 kph over the four loops. Rut Comas and Sahara came third, followed by David Fernandez on Enia, then Emma Vizcaino on Capri-Sa de Bellavista. Pol Abril had been closing in on third place when, 5 km from the finish, his horse threw a shoe. He had to back off, and ended up finishing in 6th place. Four more unlucky riders were eliminated at the finish line, but overall, 70% of the riders completed the 120-km ride, a figure that head veterinarian Doctora Itziar Tarancon was obviously pleased with. "This year was not a championship, and more riders were here for qualifying their horses, so they were not interested so much in speed, and they rode more carefully." Marta Pujadas is no stranger to winning, having won the title of Spanish National Champion in 1997 by finishing second at the World Championship for Juniors & Young Riders in Cirencester, Great Britain; and Team Gold at the 2001 World Championship for Juniors & Young Riders in Spain. 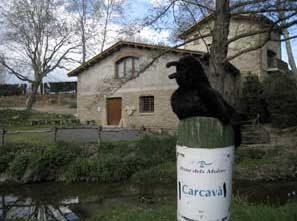 She and 14-year-old Volvo also won the 3-day Santa Susanna ride in Spain in December 2008. Several riders referred to the course as "challenging" - always up down, left right, and a lot of asphalt or stones. Nevertheless, the high finish rate indicated how well the riders were able to negotiate it. It was well-marked, and had easy access for the crews. On to the awards ceremony, a fitting end to a fine day. Also at the last race I attended, big awards were given out to the first three finishers immediately after they finished, and that was that, day over. Here, in Spain at the Raid del Cron, everybody gathered together, the time was taken to call out all names of all the finishers, and, starting with 15th place on upward, the riders came forward and prizes were handed out. And what prizes there were! The higher the finish, the more prizes received, so that by 11th place it took two hands to carry things, and by 7th place it took two people to help carry everything away: bags of feed, bags of shavings, halters, saddle pads, blankets, buckets, etc. The OC, headed by Anna Casellas, Joan Roura, Josep Manubens, Fatima Manubens Vergara, and Antoni Nardi, obviously put much time and effort into getting many sponsors for the event, besides getting everything else so well organized. The first 3 riders came back up to receive their trophies on the podium; Volvo received the Best Conditioned award for Marta Pujadas; and, finally, and most fitting, the rider who perhaps accomplished the most of everybody, the one who finished way back in 30th place 1 1/2 hours after the winner, received special recognition, a warm round of applause and hearty cheers: Mitsuko Matsui. Championship or not, it was one long-standing, successful, enjoyable, and welcoming ride that shouldn't be missed next year. Here's a bit of travel advice. I highly recommend not getting bitten by a spider (or something toxic) in one arm approximately 48 hours before flying from the US to Madrid. I also highly recommend not getting a tetanus shot in the other arm approximately 24 hours before getting on the plane(s). Nor would I recommend having to take a round of antibiotics, if you don't do well with drugs. If you do decide to do all of these things, the good thing is, you will probably forget about the sore spider bite arm, and the antibiotics you're taking, because your sore tetanus shot arm will keep you from sleeping at all the night before your flights, and during your flights; and it will make you want to shoot yourself. (Don't forget, your sore arm(s) have to somehow lift and carry your carry-on bags.) I was really hoping I wouldn't see anyone I knew who would come up and pop me on the arm and say it was great to see me. That advice came out kind of whiny, didn't it? However, a bit of humor brightened things up in New York's JFK airport. It's a grungy and dark and dreary airport, with lots of character, the rudest people ever, no free internet, no internet, and David Cassidy songs for Musak whether you want them or not. PLUS they have Dr Pepper, and the whole experience cheers you up and makes you glad you're an Owhyee'n. 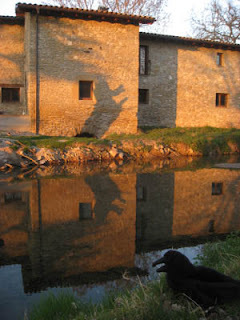 Now the Raven and I are in back in Catalonia, Spain, finally settled into El Moli, outside a little village outside of Vic (an hour from Barcelona), the 16th century mill-turned-house/office owned by Kiwi friends Paul and Madonna. I took a walk into the nearest village to get my circulation going again, and to pick up some freshly baked bread, like all the other villagers were doing. My arms are better, the weather is nice and cool, and for heavens sake I'm staying in a 16th century mill (with the Raven)! Nothing to whine about there. This weekend: the 120 km Cron Raid - the Catalon Championships. 22 days of no Stormy Kisses. 3 wicked sandstorms and a host of lesser ones. Two 95* degree days. 30+ hours of travel to get back home. 1000 Stormy Kisses. 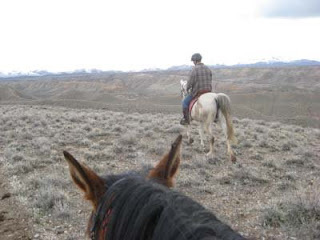 2 short but great cold Owyhee rides on Jose. Three 20* mornings. 1 morning waking to fresh snow on the ground. : ) 3 nights on my Special Pillow. 2 Ravens welcoming me back. 1 stormy blustery wintery day. 2 crisp, clear waning-winter days. 3 dog walks. 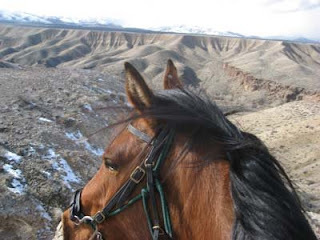 Three days of inhaling, immersing, absorbing, infusing, indulging, soaking, appreciating intensely the air/snow/sun/stillness/wind/horses/home of Owyhee before leaving again for 6 weeks. It will be enough to last me till I get home again.